Mon., June 4, 2018, 9:18 p.m.
WASHINGTON – James Neal had the puck on his stick and was staring at an open net. In a can’t-miss situation, that’s exactly what he did. “It definitely would have changed the outcome of the game and would have given us momentum,” said right wing Alex Tuch, who knows a thing or two about being coming up empty on a close-in shot. “Go home, win one game and the pressure is on them,” Neal said, hopefully. 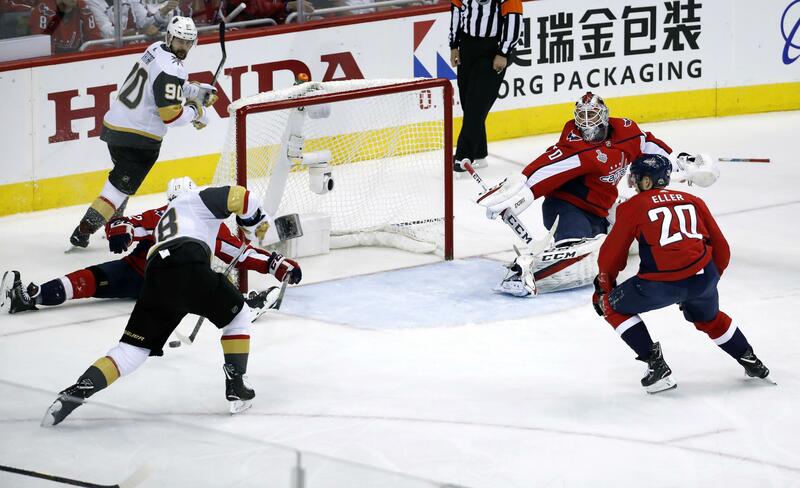 Although the Capitals have blown many a playoff series in the past, only one team, the 1942 Detroit Red Wings, has lost the Stanley Cup Final after holding a 3-1 lead. “The Stick” was wielded by Holtby , who used it late in Game 2 to snuff a seemingly sure goal by Tuch in a 3-2 Washington victory. “The Post” is a symbol of the frustration Vegas has experienced in this series after winning 12 of 15 in roaring to the Western Conference title. This much is certain: The reeling Golden Knights were looking for something, anything, to build on when they entered Game 4, and a 1-0 lead would have been splendid. Presented with a power play in a scoreless first period, Vegas worked the puck around smartly in the Washington zone. Then, Erik Haula whisked a cross-ice pass to Neal on the left side of the net, and Holtby was slow to react. Published: June 4, 2018, 9:18 p.m.